Find out if you're paying too much for car insurance. What's the average cost of car insurance in America? The average cost of car insurance is $1,426 per year, or $713 per six-month policy ($118.63 per month). Auto insurance costs vary widely based on individual rating factors, but we created an "average" user profile and gathered rates from major insurers to develop these figures. Dive into the data below to see how age, gender, location, and vehicle type affect insurance premiums. Which car insurance companies are the most affordable? 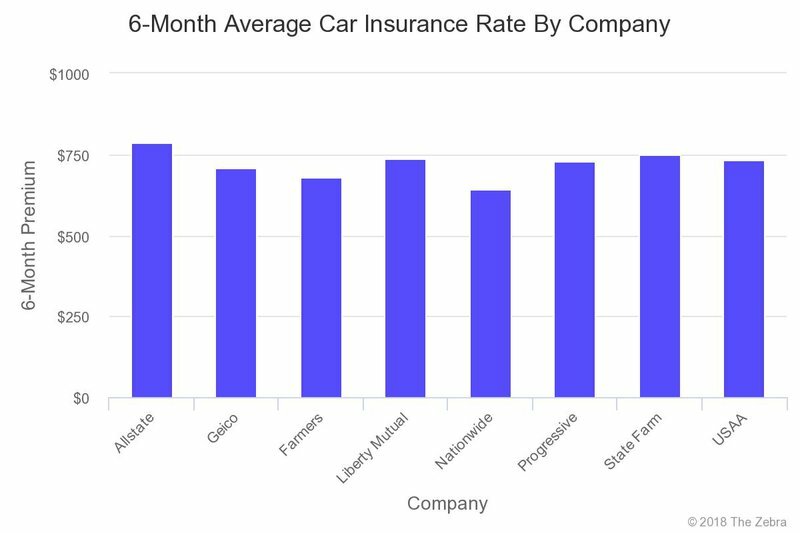 As part of our car insurance rate analysis, we compared premiums from some of America's most popular insurers. Check out average car insurance rates from the best car insurance companies below. Keep in mind your rates will vary, depending on your driving history. Among the surveyed car insurance companies, Nationwide was the cheapest based on our average profile. Our individual profile might not reflect your rates. Use our auto insurance premiums as a jumping-off point, exploring as many car insurance companies as possible. Age is a big component of auto insurance premiums. Age is a reliable indicator of how risky a driver you will be to your insurance company. In fact, every year you celebrate a birthday, you should consider it an opportunity to shop around for cheaper car insurance rates. 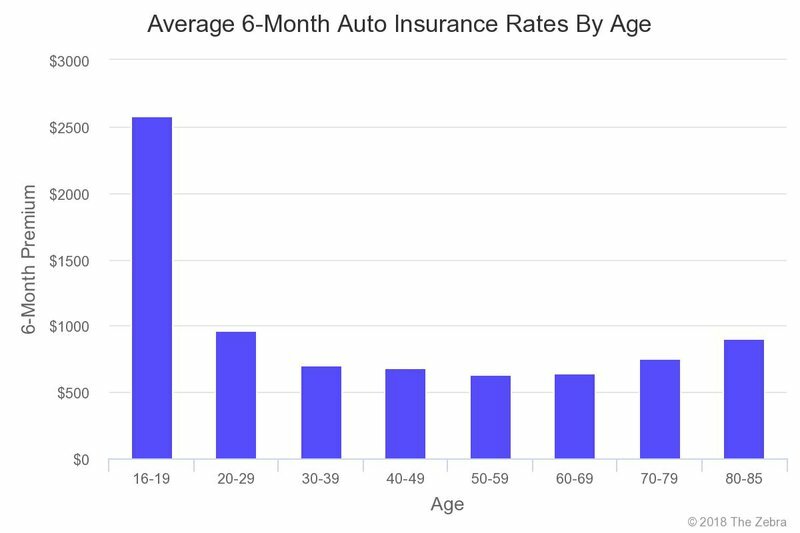 The below data shows the strong correlation between age and car insurance rates. Those aged 50 to 59 pay the least for car insurance, with all other variables constant. Aside from very young and very old drivers, age doesn't have a major impact on the average cost of car insurance. Between the ages of 30 and 60, the average difference in premium is only $20. It's important to consider other rating factors that might have a larger impact on premiums. In states like Hawaii, Massachusetts, and Montana, there is no difference in car insurance premiums for men and women. In other states, the difference between car insurance rates for men and women is small — less than a 1% difference in car insurance premiums, nationwide. Although many people assume car insurance costs vary greatly between men and women, it's a minor factor when you look at the bigger picture. However, gender does play a factor in premiums for young drivers. On average, male drivers between the ages of 16-19 pay almost $600 more per year than do female teens. Anytime you move, you'll need to update your car insurance. Car insurance is regulated at the state level and priced by zip code. Your exact location can have a major impact on your premium. Compare your rates against your state's average to see whether you're paying too much for auto insurance. Auto insurance is state-regulated and zip code-specific, so your location contributes to your premium. The difference between the cheapest car insurance state (North Carolina) and the most expensive (Michigan) is $870 per six-month policy period. This means drivers in Michigan pay $145 per month more for car insurance than do North Carolinian drivers! Learn more about auto insurance rates by state. Car insurance costs vary by region, as well. For example, in the Midwest, Michigan is expensive, but the cheaper car insurance offered in Ohio, Indiana ($1,133), Illinois ($1,120), and Wisconsin ($1,040), help lower the overall average. It goes without saying: your vehicle contributes to the cost of your car insurance. Every single vehicle will generate a unique premium based on its vehicle identification number (VIN). Insurance companies use the VIN to assess your vehicle’s mileage, accident history, and other characteristics that are factored into your premium. It’s difficult to give an average cost of car insurance by vehicle — below are some national averages. An “average rate” is hard to calculate when you combine the myriad rating factors that comprise the cost of car insurance. In addition to these major factors, a prospective insurer will look at your credit score and driving history when assigning rates. Car insurance is designed to be the opposite of average. It’s designed to mirror you and the risk you will represent to an insurer. While car insurance quote pricing will vary from person to person, it will also vary by car insurance company. Between the cheapest company (Nationwide — $677) and the most expensive (Allstate — $855), there is a $178 gap in average rates. Take the idea of an average cost of car insurance with a grain of salt. You should be as specific as possible when it comes to getting car insurance quotes and look at as many car insurance companies as possible. The Zebra's car insurance comparison engine allows you to view car insurance quotes generated specifically for you in one quick online process. Paying too much for car insurance? Compare rates and find a policy today! Learn more about how we derive our average auto insurance rates.